Known as 'The Mighty Ten Stacked Syllables' (Tib. sPungs-yig dbang-ldan), the ten syllables of the deity Kalachakra - OM-HAM-KSHA-MA-LA-VA-RA-YA-SVA-HA - represent his entire mandala base and retinue of deities. These ten interlocking and stacked syllables stand upon a lotus that supports the discs of the four planets - Moon (white), Sun (red), Rahu (blue-black), and Kalagni (golden) - with a rainbow aura enclosing them. The first black vertical 'leg' of the Ya syllable represents the mandala's wind base: then the following red Ra, white Va and yellow La 'legs' respectively represent the mandala's fire, water and earth bases. The fifth red Ma 'leg' terminates in a four-colour syllable head, which represents the four faces of Mt Meru. The sixth green Ksha 'leg' represents the form god realms above Mt Meru, as well the deities of Kalachakra's 'enlightened body, speech and mind' mandalas. 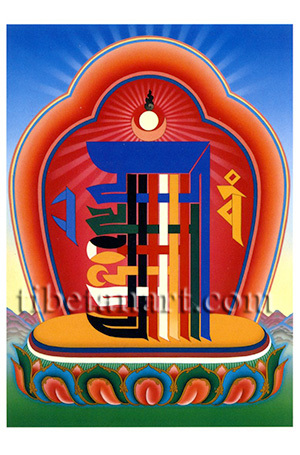 The seventh blue Ham 'leg' - which also crowns these seven syllables - represents both the formless god realms and the deities of Kalachakra's 'enlightened wisdom' mandala. The crowning red crescent moon, white sun and dissolving black flame represents the three component sounds of the syllable OM (AUM), the three psychic channels of the 'subtle-body', and the body, speech and mind deities of Kalachakra's 'great bliss' mandala. To the left and right of the stacked syllables are the blue syllable SVA and the golden syllable HA, which respectively symbolize Kalachakra and his golden consort, Vishvamata.